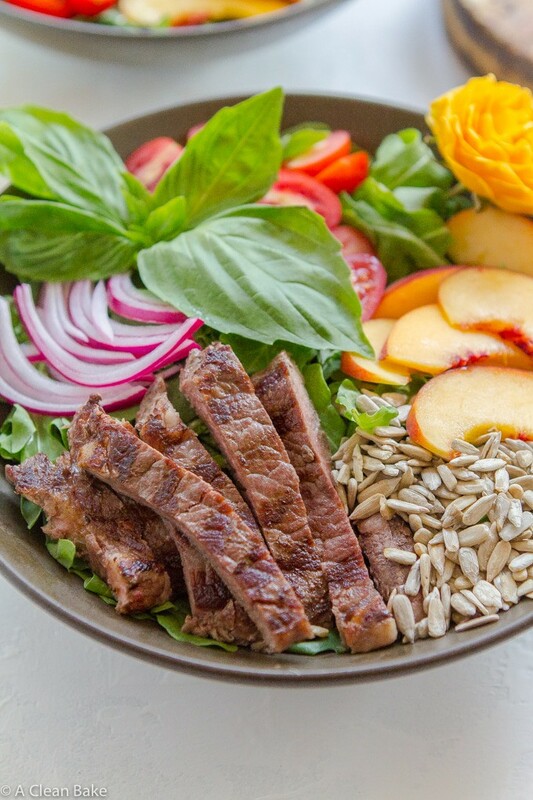 This is a steak salad recipe you’ll want to keep in your back pocket all summer long! 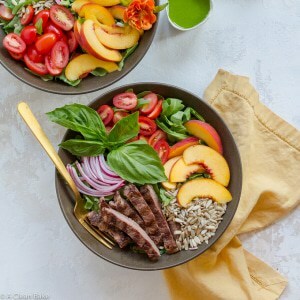 It’s an easy and versatile dish that pairs juicy grilled steak with spicy arugula, sweet peaches, plump tomatoes and tart pickled onions. Topped with a bright and tangy basil vinaigrette, it’s the perfect warm weather meal! I used ButcherBox grass-fed steak for this recipe. All of their meat – 100% grass fed beef, free range organic chicken, and heritage breed pork – is raised with no grain, soy, antibiotics, or hormones. For more information about Butcher Box, you can visit their website, watch this video, or read this post (<–plus grab the recipe for when your bacon arrives!). 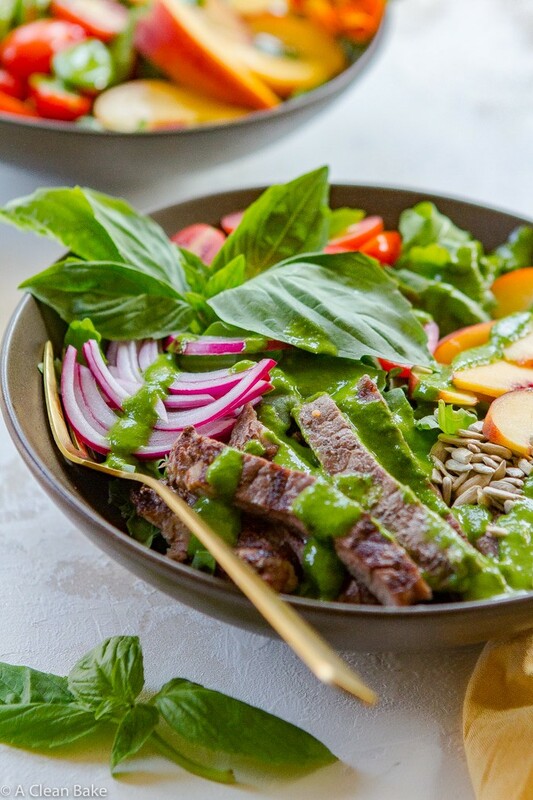 This summer steak salad was supposed to be in your bellies by now. Oh, by the way, I now say things like “belly” instead of the more practical “stomach” variation, because little ears like funny words and I’m not only drinking the Mom Kool-Aid, I’m swimming in it. Anyway, this steak salad recipe was scheduled for last week until I went to post the pictures, only to find that I had accidentally deleted them. More accurately, I had consciously deleted them from my camera, but thought I had backed them up the night before. Note to self, Current Nora: never, ever trust Past Nora. But that’s ok. If anything were going to be deleted in such an, ahem, surprising manner, I’m glad it was this salad. It meant that one more dinner was taken care of (and, having fallen off the meal planning wagon, ideas are worth the weight of this steak in gold). And it also meant that the meal happened to be a perfect summer meal: fast, using the best peak-flavor produce summer has to offer right now, not requiring you to turn on your oven or stove (although you can if you want), and did I mention fast? I was able to make this whole salad from start to finish in the time between Baby Bake waking up from his nap and the time when he realized he was famished (and conveyed the message in a less-than-subtle manner). Preheat your grill, or use a grill pan or cast iron pan (<– I linked my favorites, which I use in my kitchen) if you prefer/don’t have a grill/don’t want the neighbors to see you on your back porch wearing your PJs that you haven’t taken off yet even though it’s almost dinner time/etc. No judgement. Cooking steak can be intimidating if you’re not used to it. I’ll be the first to admit that; who’s with me? It is an expensive cut of meat, and an easily-overcooked one, but it turns out that the trick to cooking steak is similar to the trick to successfully cooking salmon: do as little as possible. That means preheat your grill or pan, grease it if necessary (it will be if you’re using a pan, and it may or may not be otherwise, depending on your grill), place the lightly-seasoned (with salt and pepper) steak on it and DO. NOT. TOUCH. Wait at least 4-6 minutes (or less if you prefer a rarer steak), then gently lift up one corner of the steak to check for grill marks. If they’re there, flip the steak, and DO. NOT. TOUCH. Cook another 2-4 minutes on the other side (or whatever, depending on your doneness preference), and remove from the heat. Now, put the steak on a plate, or a cutting board, or a tray or whatever, but DO. NOT. CUT. IT. Let it rest, covered with tinfoil or uncovered, for at least 10-15 minutes. This allows it to “rest” and reabsorb all the juices and flavor. 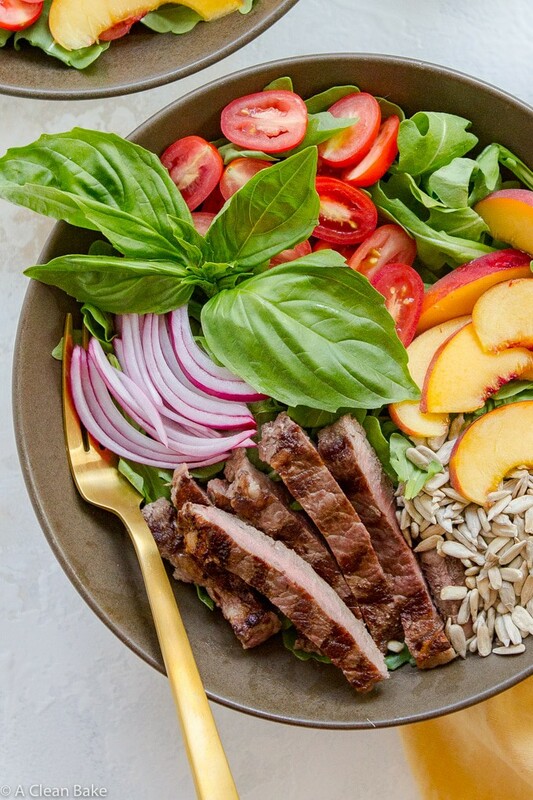 While the steak is cooking, add a bed of arugula to 2 bowls. 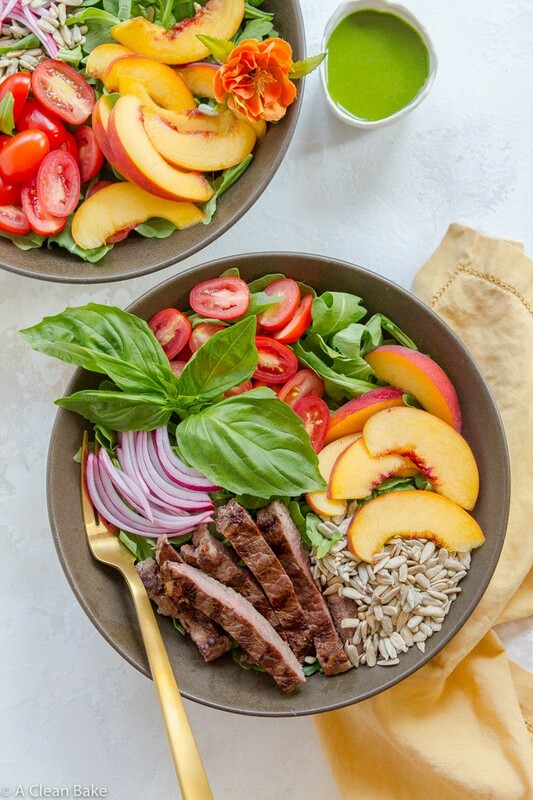 Top it with slices of fresh, ripe peaches, succulent tomatoes, quick-pickled onions, and crunchy sunflower seeds. Set them aside until the steak is done resting. While the steak is resting, add all of the dressing ingredients to a blender or food processor and puree until smooth. It couldn’t be easier. Then, simply slice the rested steak and add it to the prepped bowls. Drizzle it with a generous stream of basil vinaigrette and enjoy! 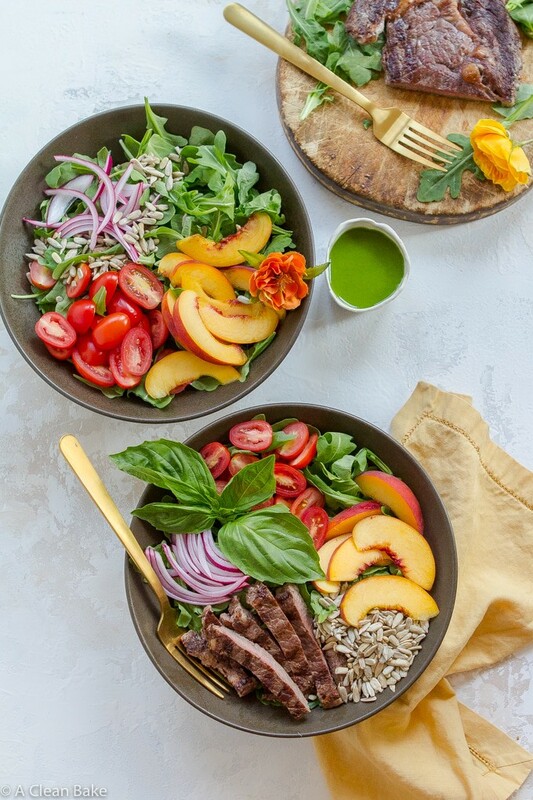 If you’re interested in trying this salad with the outstanding-quality grass-fed steak pictured above, you can get it though ButcherBox. ButcherBox is a monthly delivery of super-premium-quality meat (the cuts and types change each month, and the box includes recipe inspiration, just in case!) that comes right to your door. All of their meat – 100% grass fed beef, free range organic chicken, and heritage breed pork – is raised with no grain, soy, antibiotics, or hormones. And yes, it is incredibly fresh, shipped deep frozen with dry ice, and absolutely delicious. If you’d like to try it, click here to get $10 off and free bacon with your first box! For more information about Butcher Box, you can watch this video, or read this post (<–plus grab the recipe for when your bacon arrives!). Place the sliced onions in a bowl. Cover with vinegar and set aside. Sprinkle the steaks with salt and pepper. Preheat the grill, or grill pan. Once preheated, place the steaks on it (if using a grill pan, you may need to oil it slightly to prevent sticking). Let the steaks cook - do not touch or move them - for 3-4 minutes. After 3-4 minutes of cooking, gently lift up one corner of one of the steaks to check for grill marks. If the marks have appeared, flip the steak. If not, continue to cook, checking every minute, until grill lines appear. Do the same with the second steak. Cook the steaks on the other side for another 2-3 minutes, or to your desired level of doneness. Remove from the grill or pan, and place steaks on a plate or cutting board. DO NOT CUT INTO THEM. Cover with a loose tent of tinfoil, set aside and allow them to rest for 10-15 minutes. While the steaks are resting, make the dressing by adding all of the ingredients to the jar of a high speed blender, and process until smooth. If the dressing is too thick, add an additional 1/2 - 1 Tablespoon olive oil. Taste and add more salt and pepper, if desired. 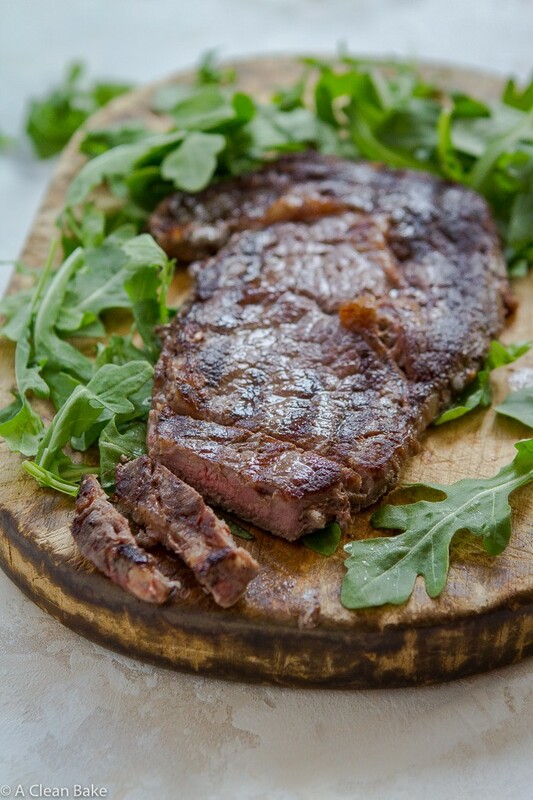 Slice the rested steak and add it to the salads, then drizzle with dressing and serve immediately. Replace the balsamic vinegar with apple cider vinegar to make this compatible with a GAPS, SCD, or anti-candida diet. Reduce the calories in this salad by using one large steak and dividing it between both salads. Thank you to ButcherBox for providing the ingredients that inspired this delicious recipe. This post contains affiliate links, which means that if you click through and purchase a product, A Clean Bake receives a small commission. All proceeds go toward continuing to bring you delicious, healthy recipes every week, and this does not affect the price you pay. Thanks for supporting A Clean Bake!